Haiti has long been plagued by natural catastrophes as well as political-economic strife. Looking to break a cycle of poverty and environmental degradation, multinational businesses, multilateral development banks, foreign aid agencies, non-governmental organizations and local communities are working to help put Haiti on the path to recovery from a devastating 2010 earthquake. Haiti has the highest rates of deforestation of any country in the world – a mere 2 percent of Haiti's original forests remain. Deforestation on such a grand scale has contributed significantly to a host of profound, persistent socioeconomic problems. Loss of soil from erosion, higher and more extreme incidences of flooding, degradation of water resources, and habitat destruction have all but crippled agriculture and drastically reduced biodiversity in Haiti. Compounding this, shifting seasonal rainfall patterns and less in the way of precipitation are also taking a heavy toll. Smallholder farms provide the traditional and often sole means of livelihood and survival for the large majority of Haiti's large rural population. It's estimated that around two-thirds of Haiti's population relies on small-scale farming for basic subsistence and their livelihoods. Offering a clear indication of just how closely and inextricably intertwined are poverty and environmental resource degradation, rural Haitians – for wont of access to affordable, reliable energy sources – continue to chop down trees in order to survive from day to day. Besides clearing forests to create new farmland and pasture, rural Haitians use the firewood for cooking and make charcoal for sale in Haiti's cities, where it continues to serve as the predominant cooking fuel, Locke explained. These and other environmentally unsustainable and socioeconomically pernicious practices all but assure the cycle of poverty and environmental degradation will continue across succeeding generations. 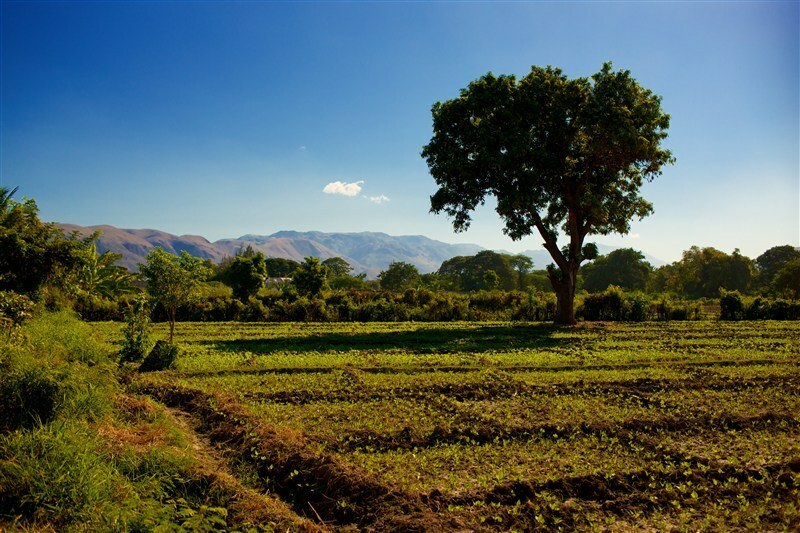 Climate change is also having a negative impact on agriculture and rural communities in Haiti, exacerbating the effects of unsustainable farming practices and environmental resource degradation. “There has been a discernible rise in temperatures over the past 10 years,” as well as greater uncertainty regarding the timing and amount of seasonal rains, Locke pointed out. Back in 2009, Locke and fellow SFA co-founder Timote George started searching for a corporate partner that was willing to fund their vision of engaging local farmers in and around the rural, northern coastal town of Gonaïves to plant trees and help reforest Haiti. The 2010 earthquake that left over 200,000 dead, 300,000 injured and all but leveled the capital, Port au Prince, delayed their efforts. Having subsequently begun to develop an agroforestry co-op in which local farmers would plant trees across a 40-square-mile area, SFA's co-founders approached Timberland, asking if the company would sponsor the project. On their first approach, SFA's co-founders envisaged the farmer reforestation project taking the same form of the traditional NGO “cash for work” model: Farmers would be paid to plant trees on their lands and provided with basic tools and training. “The response was that [Timberland was] willing to assist by financing a project for farmers to plant trees, but they wanted to see an 'exit' strategy that would assure the program's long-term sustainability,” Locke recounted. “Demonstrating financial independence was not something I was particularly interested in, but after long, hard study and experience, I've be come a zealous convert." Coming up with a credible sustainable and market-based project model posed a stiff challenge. “It's a huge problem, especially in a place like Haiti where the level of agriculture is so depressed,” Locke elaborated. Previous sustainable developments projects based on a “cash for work” model had been tried and eventually wound up failing. The fundamental flaw in such projects, Locke said, is that “if you create a project predicated on continual payments in a 'cash for work' program – you pay them to plant better seeds, improve harvesting and adopt more sustainable agricultural practices – when the payments stop, so do the improvements. Rather than taking a traditional NGO "cash for work" approach, SFA’s co-founders, in partnership with Timberland, instituted a community agricultural development model whereby farmers volunteer to grow trees in order to earn seed, tools and training. That includes education and training regarding how to cultivate an appropriate mix of plants and tree crops on their lands. Among a host of associated sustainable benefits, the payback for farmers has been healthier soils, land and water resources, higher quality crops, and greater yields. In sum, after five years the agroforestry project has resulted in a sustainable, robust and resilient mix of plant and tree crops that has raised farmers' incomes and given them free time they have not had for many years to engage in other family and community-based activities and development work. Tomorrow we'll share the details of the partnership with Timberland.